Those who have been following me would know that I have been publishing books on Amazon both in kindle and paperback formats. You can find my books on my Amazon author page. Making money from Amazon is not a new thing, many bloggers are taking to writing ebooks as part of their online business. In fact, writing ebooks has become an industry on its own and many are trying their luck. But in order to be successful in selling books on Amazon, it takes a lot of hard work. First there are too many books out there in a given topic and buyers are spoilt for choice. In fact, there are so many of these books that the buyers don't know which one to buy. If you want to stand out from the rest of the other sellers, you must write outstanding books otherwise your books will be lost in complete obscurity in the Amazon.com jungle. I have added another book to my kitty for my online business. This time the book is directed towards children. 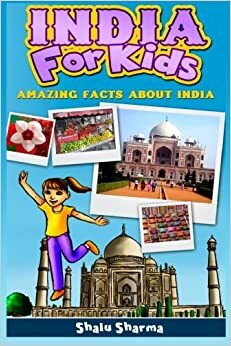 The book is called, "India For Kids: Amazing Facts About India" both in the kindle and paperback edition. My aims are to sell the book to both parents wanting to teach their children about India and travellers who want to polish their knowledge before leaving India. Really descriptive and informative.Helped me a lot. Will share it across other platforms.Keep writing. Very helpful information provided. Thanks.